Point of Destruction is a single-screen shooter, and an updated version of the C64 classic Proof of Destruction (1987). Your objective is to endure waves of alien attacks by surviving until the clock runs out. There's 100 waves in total, as well as 20 different enemy types (including seven brand new ones). Collecting purple icons gives you a shield, while green icons give you smart bombs, and your standard pea-shooter can be upgraded multiple times by obtaining red icons. 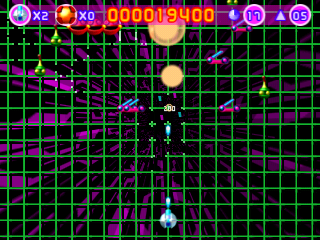 The gameplay can favourably be compared to Tempest (1994, Atari Jaguar) due to its grid-like level design, zoomed stage transitions, stunning particle effects and awesome techno soundtrack. It's just as frantic too, and what's most impressive is that there isn't even a hint of slowdown. While taking damage results in you losing your power-ups, the collision detection is pixel-perfect and it's strangely satisfying to survive long enough to build up your weapons again. Just when the game has presumably reached its apex, the developers throw in a massive curve ball in Stage 51; suddenly enemies start appearing from the bottom of the screen, and unless you have the side-shot power-ups you have to dodge them first and then fire! It's a brilliantly simple gameplay twist, but one that adds some much needed variety at a crucial point. It becomes a real fight for survival and the claustrophobic, cluttered battlegrounds and fast-paced music do a fantastic job of evoking an intense atmosphere. The Bonus Stages task you with surviving for as long as possible against an onslaught of enemies and unbreakable barriers. They're brutal due to the ridiculously fast rate of obstacle descent, but it's enjoyable trying to beat your best score by strategically using smart bombs to earn extra lives. With its smooth controls and non-stop action, Point of Destruction is the kind of game where you start playing and before you know it an entire hour has flown by! It's highly addictive trying to complete a previously unbeatable wave and overall it's the perfect mobile game to dip in-and-out of. Random trivia: This game was developed by the same team that made Trailblazer (2005, Gizmondo).